On my last morning in Arlington, I was craving some really good iced coffee, and after doing a quick web search, there was one place that made several recommendation lists: Oby Lee Coffee Roastery. This immediately drew my attention, since it was actually a familiar name that I didn’t think I’d see again. Oby Lee used to be my go-to place for coffee on summertime trips to Rehoboth Beach, DE, but a few years ago, they closed up shop and were replaced by a distinctly less pleasant coffee shop. So it was interesting to see their name pop up in the Arlington area. I’m glad to find that Oby Lee is still in existence, just in a different place (talking to the owner they got frustrated with the seasonal nature of the Delaware beach business, so they "moved to where the people are"). So now they’ve got a coffee shop, creperie, and wine shop in Arlington just south of the Clarendon Metro. 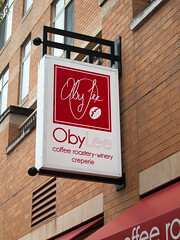 So when I was craving a good iced coffee and a light breakfast, Oby Lee was worth checking out. Locating on the first floor of a condo building a few blocks south of the Clarendon Metro station, Oby Lee is in a somewhat cozy location (although in good weather they’ve got some nice cafe seating outside). They’ve also branched out from coffee and pastries, offering wine by the ounce (in those machines that take cards and dole out small samples by the ounce, so you can try out some high-end wines that you normally might consider too expensive to sample). 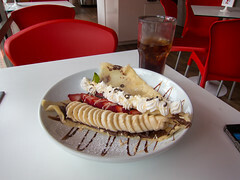 But since it was breakfast, I went for an iced coffee and a banana, strawberry, and Nutella crepe. 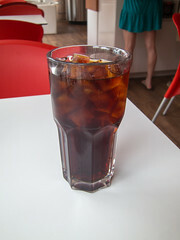 For starters, the iced coffee was as good and refreshing as I remember from Delaware. Oby Lee selects and roasts their own coffees, and then makes iced coffee using cold brewing (aka “Cold Process” or “Toddy”). The result is a particularly bold but smooth cup of coffee, and a great way to start my morning. The crepe was also a rather impressive breakfast: a good, crispy crepe, served up with an entire banana, a generous portion of strawberries, and a good solid schmear of Nutella. Topped with some decent whipped cream, and this was a very tasty and well-presented breakfast. Overall, going to Oby Lee was, despite the move inland from the Delaware beaches, much like returning to my old favorite location. 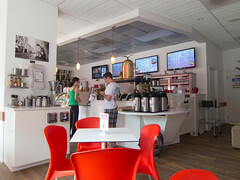 And they are still churning out some really good fresh-roasted coffee. I’ll definitely be back.